Well, Bizarro Twins posts have taken a hit lately with my new job and the holiday season and family visits and such, but SebaSM Comics are going strong! Here are this week’s latest updates: Confusion abounds this week, whether it’s not knowing how to handle flattery or braving the minefields of spoken communication (as opposed to my forte of the written word)… I should have something up for Christmas next week, and then we’ll try to get back into the Bizarro Twins swing of things for reals! New SebaSM Comics! Let’s not let the holiday season get in the way of tacky jokes about online dating and such… Speaking of which, this comic was intended as a follow-up to an earlier online dating comic, but got interrupted cuz of Thanksgiving… Oh, those pesky holidays! UPDATE: Sorry for the non-link with the second image, fixed now! 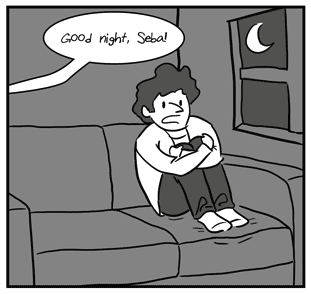 Two new SebaSM Comics this week, including a special Thanksgiving edition, above! Predictably, the Thanksgiving edition is also about online dating, because I am desperate.